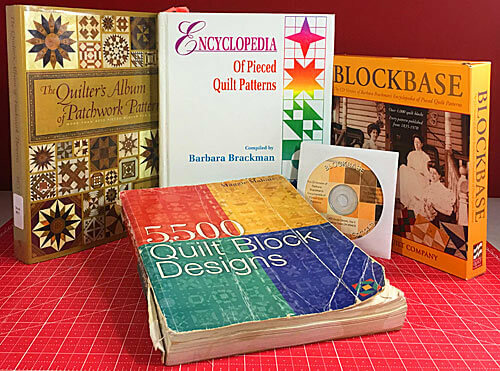 The Colorado Beauty quilt block is a close relation to the Jack in the Box block—the only difference being the sashing between the units and a center square are removed. The beauty of connector corners (sometimes called 'sew and flip' or 'stitch 'n flip') is that you start out essentially with a fabric foundation that is cut the exact size. It is a part of the block and there as a reference the whole time. Saaaa-Weet! Towards the bottom of the page are other blocks that use the same units. If you like making a Colorado Beauty, you just might like making those, too! To press, first press the patches as they were stitched, right sides together (RST). Then open the pair and press flat. For the pinnacle in perfectly pressed patchwork, check out our Best Pressing Technique. 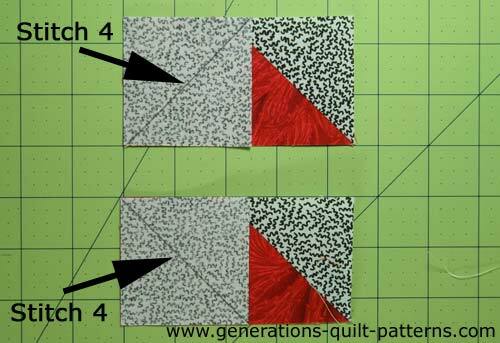 The charts below are for two different techniques—blue is if you want to paper piece, mauve is if you choose Connector Corners. 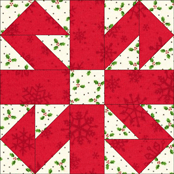 In the paper piecing chart, the patches are cut over-sized to make placement a breeze. 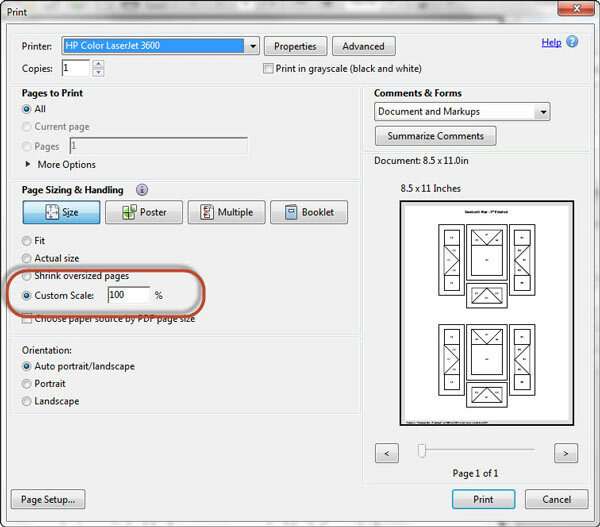 You can print the needed patterns from the chart (see row highlighted in yellow) after choosing the finished block size. 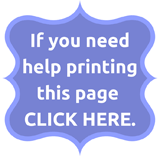 After printing, use the 1" square on the printed copy to make sure the pattern is the correct size. For connector corners, patches are cut exactly to size. 2, Sky	 B	 8	 2⅜" x 2⅜"	 2⅞" x 2⅞"	 3⅜" x 3⅜"
Goose	 A	 1	 3⅝" x 3⅝"	 4⅝" x 4⅝"	 5⅝" x 5⅝"
**Print 2 copies for a total of 4 units. 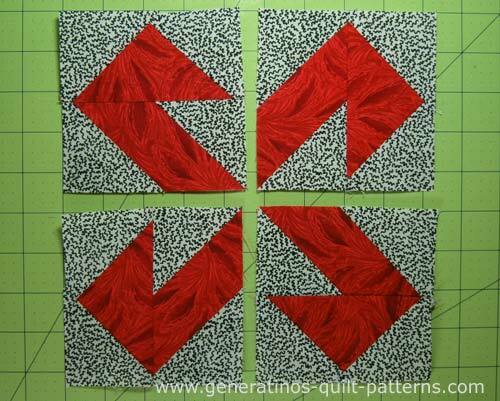 1, Goose	 A	 8	 1½" x 2½"	 2” x 3½"	 2½" x 4½"
2, Sky	 B	 16	 1½" x 1½"	 2” x 2”	 2½" x 2½"
Beauty quilt block measures...	 4½"	 6½"	 8½"
To paper piece them, click here for detailed instructions. Then click the 'Back' button on your browser bar to return here. On the backside of the sixteen #2/Sky squares draw a diagonal line, dark enough to see but light enough so that it doesn't show through to the front side. I like to use a mechanical pencil because the line is reliably thin. With RST, align a #2/Sky RST on the righthand side as show below. Make sure the pencil marking bisects the lower right corner and the top center (arrow). Stitch on the line. I use an anchor cloth (that's the nasty looking thing behind the presser foot with all the thread on it) so that my machine doesn't 'eat' the patches as they are fed into it. Press flat to set the seam. 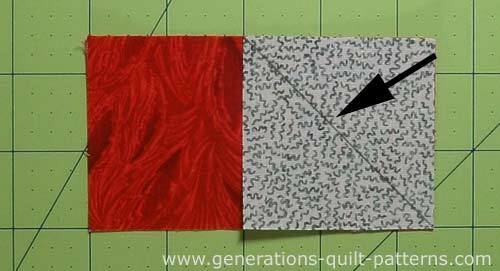 Then press open so that there are three layers of fabric in the upper right hand corner. Make a total of 8 like this. Decision Time for Trimming...or not! ...those extra layers do add lumpy bulk to your seams. You can either remove both of them leaving behind a 1/4" SA (top) or remove the extra layer of the #2/Sky (bottom). If all the layers line up beautifully, then I remove both. 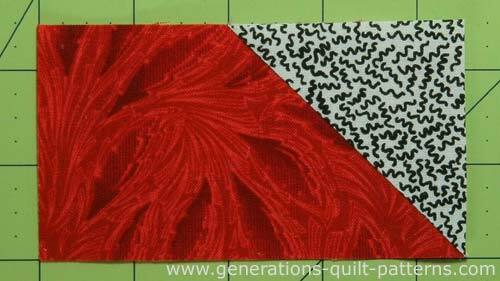 If my sewing leaves a bit to be desired (and it happens to all of us at one time or another), I cut away just the one layer. Because the rectangle is cut to the exact size it allows us to fudge just a bit like this, if needed. The choice is yours. With the Flying Geese units, if you are going to trim, you need to do it now, before the second Sky is added to the goose. Once it's been added it's difficult go back and trim out layers. To four partially pieced units, with RST, layer a #2 on the left side, but this time with the pencil mark intersecting the lower left corner and the center of the top as in the photo below (top). With RST, align another #2 on the left hand side of remaining four. The diagonal marking intersects the upper left hand corner and the center of the bottom side. Use the photo above (bottom) for reference. Press as before with the layers of the squares towards the corners. 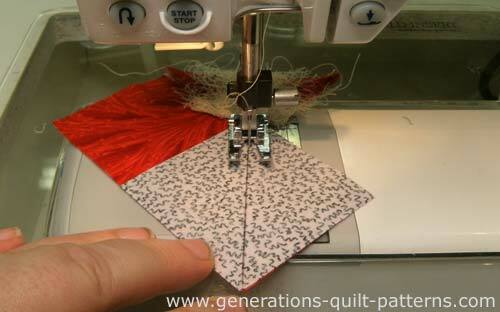 Trim the extra layer(s) of fabric away just as you did for the first eight squares. 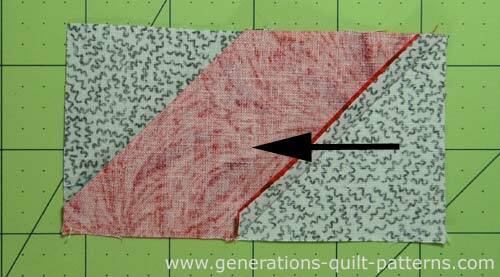 If you removed both of the extra layers, we can 're-press' one seam on the rectangle so that our seams will nest and making matching points easier. As you look at its back side, we've pressed both SAs to the left. Use the photo below for reference. With RST, layer a stitched rectangle and goose unit. The SAs on the outside edge of it will nest together. I use pins to hold everything in place for stitching because it's a bit lumpy right now. 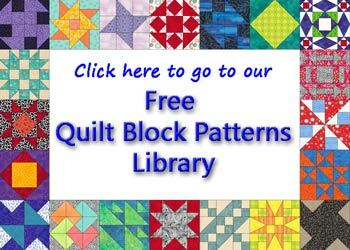 Use the 'Unfinished unit measures...' numbers from the charts to confirm that your patchwork is the correct size. Lay the pieced patches out into rows. 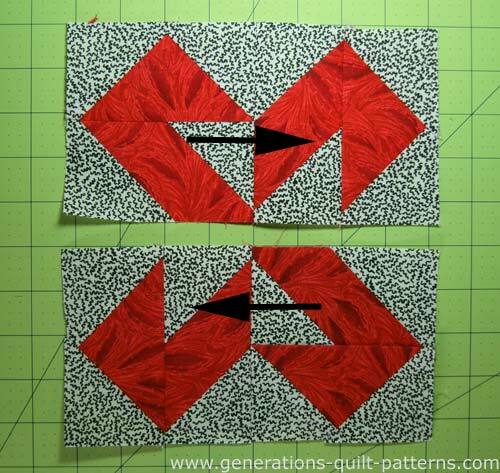 The goose points out of the center and is rotated a quarter turn as you move clockwise around your Colorado Beauty quilt block. Stitch the patches into rows. Press the SA in the direction of the arrows. Beauty may be in the eye of the beholder. But you must admit! 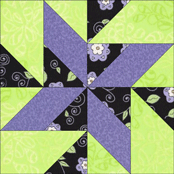 This Colorado Beauty quilt block is da-bomb! 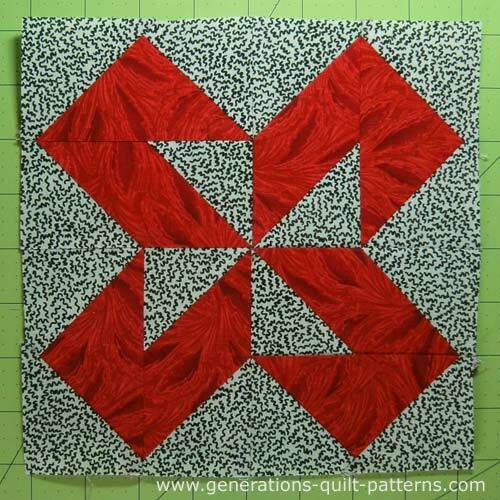 There are a few variations on this design, though all still emphasize the center pinwheel. 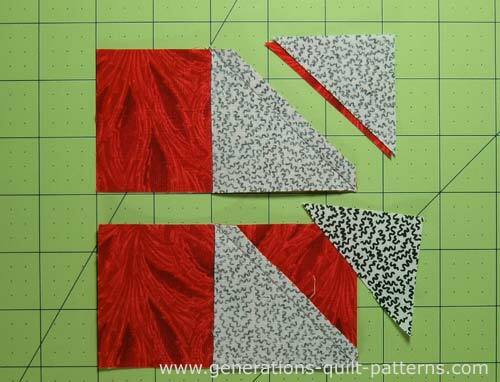 The Flying Goose is now two HSTs! 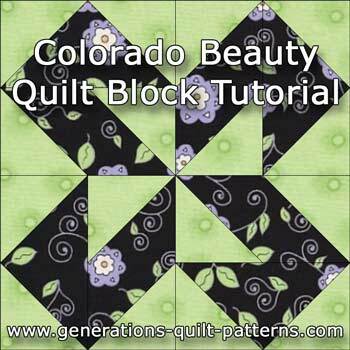 Rectangles (like a sashing) and a center are added to the original Colorado Beauty quilt block.